Need space for that special event? A relaxing waiting/viewing/lounge/meeting area with free high speed Internet, refreshments, full locker rooms, showers, sauna, heating and AC, outdoor half basket ball court, and 1.8 acres of outdoor space near rural country roads with an incredible view of the Bridger Mountains for your enjoyment. We are able to provide space for community events,workshops, seminars, conference, parties, reunions, and you name it, with tables and chairs for 10-200+ people. Specialty classes and group classes, all may include; laundry service, Life Fitness weight training equipment, personal floor mats, 10 water filled heavy bags and 3 levels and sizes of open floor space. Personal Trainers have access to all the equipment and any floor space available during the training times, (Note, availability may be contingent on specialty class use). Open floor 1 = 2000+ sq. feet of matted flooring OR Polished concrete (depending on your activity) with 12 ft. ceiling separately control heating and AC. Open floor 2 = 1000 sq. feet of suspended wood/linoleum surface with separated controlled heating and AC. Sound system with wireless mic and a variety of aerobic equipment. Open floor 3 = 800 sq. feet of matted flooring in the lower level with separate controlled heating, life Fitness weight machines, and a sound system. 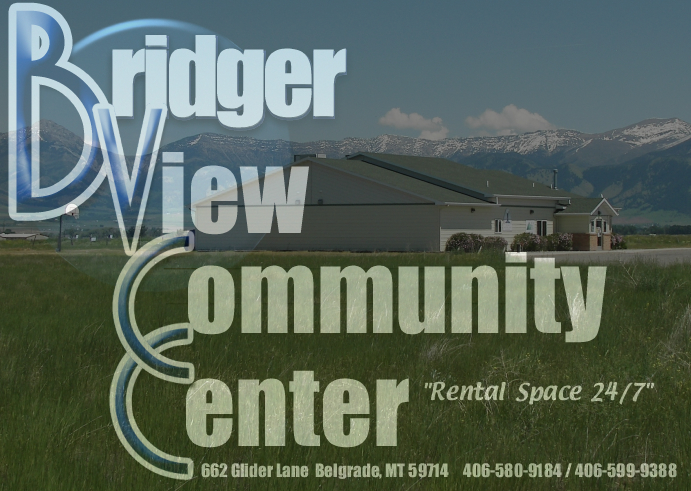 Bridger View Event Center RQLC LLC. All rights reserved.